For anyone consuming a standard American diet that’s heavy on processed meat, dairy and overcooked vegetables, adding the right raw foods can certainly boost your health. Raw foods have a lot going for them, especially when it comes to preserving nutrients. Yet, there’s still some foods that are unsafe if eaten raw and others that are simply more nutritious when cooked. Here are nine foods you should avoid eating raw. If eating raw cookie dough is your favorite indulgence when baking, listen up! Tasting uncooked food made with flour could make you seriously ill, suggests a study published in The New England Journal of Medicine. 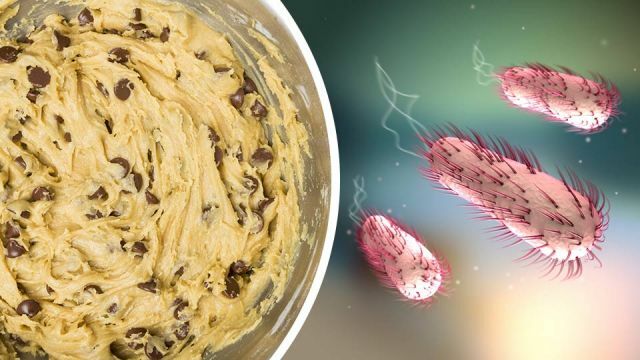 Research, which led to a recall of more than ten million pounds of flour in 2016, found that a type of E. coli bacteria previously discovered in wet environments, like ground beef and lettuce, can also thrive in dry hosts like baking flour. A total of 56 cases of infection were identified in 24 states. And over a quarter of patients were hospitalized. One even went into kidney failure. All of the people, however, recovered. Raw kidney beans are hard and bitter. So, it’s unlikely anyone would grab a handful to snack on. Nevertheless, it’s important to understand that there is a reason beans need to be cooked to a soft state. Beans contain proteins called phytohemagglutinin. When eaten raw or are inadequately cooked, kidney beans are toxic and can lead to food poisoning, reports the Independent. There are other beans that contain phytohemagglutinin, but red kidney beans have the highest concentration. So, just a handful of raw or undercooked kidney beans is enough to cause gastrointestinal issues like vomiting, nausea and diarrhea two to three hours after eating. In fact, the more you eat, the more intense your symptoms will be. Once again, make sure you have cooked your potatoes through. Unlike pasta, al-dente potatoes can be dangerous. Raw potatoes are potentially toxic because of a compound called solanine. Even in small amounts, solanine is highly toxic, according to MedlinePlus. Potatoes with just a little green under the skin have a higher concentration of solanine. Moreover, potatoes that have started to sprout eyes also have a higher concentration of solanine. Potato poisoning may cause stomach pain, headache and even paralysis. Therefore, if you cut into a potato that’s green throughout, don’t eat it — even when cooked. Raw olives, like potatoes, are something you don’t want to eat raw. While they won’t make you sick, unprocessed olives straight from the tree are very bitter. And green olives are by far the most bitter, thanks to a compound called oleuropein. The only way to remove the bitterness and make them edible is by curing them with either a lye or brine solution, according to Cook’s Info. Although some raw food enthusiasts may eat raw olives, no Mediterranean olive producer would ever consider eating raw olives. Raw wild mushrooms are rough on the stomach and tough to digest. Cooking them helps you avoid serving up gastrointestinal distress. Additionally, many are actually quite toxic and even potentially deadly when eaten raw. Cooking, on the other hand, breaks down the harmful compounds. That said, some wild mushrooms are deadly raw or cooked. So, unless you are 100 percent certain a wild mushroom is edible, don’t eat it! Yes, you can eat raw steak tartar. No, you can’t eat raw pork. Sure, the danger associated with eating uncooked or undercooked pork has lessened over the years. Still, eating pork raw is not advised. A study published in Comprehensive Reviews looked at how Salmonella, Campylobacter, Trichinella spiralis, Toxoplasma gondii, Listeria monocytogenes and methicillin-resistant Staphylococcus aureus relates to the pork industry. Researchers found that, overall, pork does contribute to foodborne diseases. One parasite you definitely don’t want in your gut and intestines is tapeworm. A tapeworm can grow longer than 12 feet and live inside its host for years, suggests Medline Plus. It has many segments and each segment can produce eggs. So, pass on the raw or undercooked pork. Of course, just like pork, chicken should never be eaten raw or pink — no matter what some chefs advise. Between the processing plant and the supermarket, raw chicken picks up lots and lots of nasty bacteria. If digested it can cause chills, diarrhea and fever. In fact, salmonella poisoning, often linked to contaminated foods like poultry, affects about 1.4 million Americans each year. It’s also responsible for almost half the bacterial infections in the U.S., according to Medical News Today. You may find a few shaved asparagus salad recipes floating around the internet. But, in reality, asparagus is a vegetable that really should be cooked. Some vegetables are just more beneficial for your health when eaten cooked, and asparagus falls in this category. Asparagus has more cancer-fighting antioxidants when cooked. Cooking also increases absorption of vital nutrients like vitamins A, B, C, E and K. You won’t get sick from eating raw asparagus, but cooking it will help break down the fiber, making it easier to digest. Like any fresh produce that’s eaten raw or lightly cooked, sprouts carry a risk of foodborne illness, suggests Foodsafety.gov. While they’re certainly tasty on top of salad, use them with caution. When uncooked, they can harbor harmful bacteria such as salmonella, E. coli and listeria. Sprouts should only be purchased fresh. But young children, pregnant women, the elderly and anyone whose immune is compromised should avoid sprouts altogether. So, what about those homegrown sprouts you ask? Well, when it comes to harmful bacteria, they’re not immune. Even if just a few harmful bacteria are present in or on the seed, the bacteria will multiply quickly during sprouting, even under the sanitary conditions of your home. Previous articleDoes This Woman Deserve To Die Because She Can’t Afford Her Medical Bills? Hey Buddy!, I found this information for you: "Here Are The 9 Foods You Should Never Eat Raw". Here is the website link: https://www.thealternativedaily.com/9-foods-you-should-never-eat-raw/. Thank you.